Sir Thomas More, who coined the word utopia, and wrote a novel by the same name, very likely never imagined how many communities would be formed in hope of achieving a perfect society. In the late 1800s, Finnish immigrants came to Vancouver Island in search of a better life. Many of them worked in the coal mines. One of them, a man by the name of Kurrika, dreamed of a place where Finns could live an ideal life. He the Kalevan Kansa Colonization Company Limited to encourage more Finns to immigrate to Canada. He traveled up and down the coast, looking for land suitable for building such a community. In 1901, the provincial government granted the Kalevan Kansa Company ownership of Malcom Island. The island was promptly renamed Sointula, which means "harmony." Here a few hardy souls attempted to create paradise from the wilderness. The task was unending. The colony was soon in debt for they discovered that making a living in this rough environment was an arduous business. Logging, fishing and agriculture proved insufficient. A disastrous fire combined with debt and disillusionment led to the dissolution of the colony within 10 years of its inception. Most of the Finnish immigrants left, but a few stayed, and other settlers joined them. Today, Sointula is a small community whose members continue to struggle to make ends meet. Our neighbours grew up on the island and left for economic reasons about 20 years ago. The houses are neat and most are painted in colours that bring brightness to the many grey, rainy days of the area. It's a gorgeous island. We drove out to Bere Point Campground. Someone created this unique bench that has a view over the water. The sun shone while we were there, and the air was very fresh and cold. Orca whales come to these beaches to rub their tummies on the rocks. Here's a link to a youtube video showing the whales. We didn't see any whales during our visit to the beach. While we were on the beach, a bald eagle lifted off from a tree just above us. I pointed my camera straight up to get this shot. Enormous trees with tangles of roots lie on the beaches, thrown up as if they were toothpicks by the power of the waves. We visited Sointula in late March during our road trip to the north island. Each island has its own culture and history, all fascinating. It must have been a very hard life trying to exist and grow the community there, although the houses are very attractive. Are they available to rent for a short vacation? Love the driftwood bench that some artistic person made so travellers could rest and enjoy the view. Sointula looks beautiful on a sunny day but I imagine that the conditions would be harsh for much of the time. I remember writing an essay on Utopias in Grade 9 (a lifetime ago) and coming to the conclusion that since people are not perfect, a perfect community can not exist. But the Finns, like the Doukhobours in the Kootenays, must have been thankful to Canada for giving them a chance for a new life. I love reading stories like this. 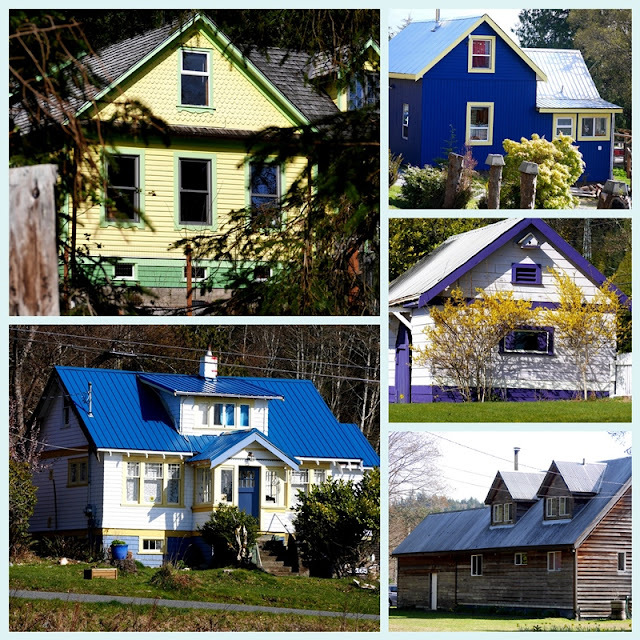 Malcolm Island is beautiful ... trees on the beach and the wonderfully colorful houses. Very special. What an interesting history that Sointula island has. One has to admire the spirit of the early immigrants who tried so hard to make their Utopia. Both my grandfathers were coal miners, so i know they dreamt about an easier life. Just beautiful! And thanks for giving us the historic tour...it was all new to me and most interesting. What an amazing tour you took us on, such a shame that economically they couldn't make it work. Loved the bench, what a great place to sit and dream. What an interesting trip with visits to this island. Thanks for sharing the history. That bench is great. Hope you have a good week! In our early years on the island I read a book about Sointula and have been fascinated by it ever since. One meets people with Finnish last names from time to time here, and it is interesting to learn about the connections. What a lovely trip you must have had. The idyllic appearance of the landscape and the prettily painted houses obviously belies just how difficult life must be to thrive and live in such a remote spot. What a gorgeous photo of the Eagle! WOW! And how interesting about this town. I see that Pondside has mentioned a book and I think I remember reading about this place a long time ago. Enjoy your week! I love the blue roofs!! We could easily pretend it was Utopia for the duration of a camping trip! Fascinating history there. What a fantastic shot of the eagle! I love the yellow and purple houses. Thanks for the interesting tour, Lorrie. Wow! The roots on that tree are tremendous! Great shot of the eagle, and lovely pictures and post that looks like a place to dream of. That is an interesting story of people and place. Nice capture of the bald eagle; you were quick on your feet! Beautiful, interesting post, Lorrie. That blue!!! It was sad to hear the project wasn't successful. However, I can imagine Finns living a very happy and satisfactory life in Canada. Thank you for the history lesson of the ares, Lorrie. That bench is so creative, isn't it? Your photo of bald eagle was outstanding. I enjoyed your photos on your five favorites, too. No, I haven't tried cauliflower rice yet, but would like to. I know you're enjoying signs of Spring emerging! Such an interesting and beautiful place, Lorrie. Love the pretty houses and the beautiful, deep blue sea. Fascinating post, the shoreline looks wild and beautiful even more so in winter I imagine. Thank you - Happy May! The history of this island is fascinating. I can imagine it would be hard to make a living there. What sweet cottages too.